Growing up I loved Star Wars. What am I saying, I still love Star Wars (Jar Jar Binks - not so much). 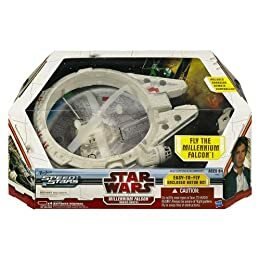 When I was a kid, my cousin had a ton of Star Wars stuff and I always wanted the Millennium Falcon. I can't for the life of me remember what I traded my cousin, but I swapped him something for an original Millennium Falcon. Well, now I can once again own the ship that made the Kessel Run in less than twelve parsecs. You can own one too for around $200. Maybe I can even get my mom to buy it for me. Um. probably not.